Fjall from kate shaw on Vimeo. Melbourne artist Kate Shaw is on fire with her latest landscape paintings – surprisingly inspired by snowy scenes encountered during her recent residency in Iceland. Brushed, sprayed, coagulated and dripping, Shaw’s acrylic and resin palette of chemical, toxic and volcanic tones contrasts normally frigid images of Iceland’s mountains and fjords. It’s like she’s popped the acid and gone astral travelling to utterly different chocolate boxes. Most of her Iceland paintings – in the Fjallkonen (Lady of the Mountain) show at the Fehily Contemporary gallery in Melbourne’s Collingwood during October-November 2013 – sold to her expanding coterie of Australian fans (and some New Zealanders who flew in). These are collectors and curators who are laser-tracking the cream of this decade’s crop of on-trend antipodean artists. ‘Freyja’, acrylic and resin on board, by Kate Shaw, 2013. Kate Shaw interprets our planet’s threatened environments like Secession-era Vienna’s social portraitists – notably Gustav Klimt and Egon Schiele – used grotesque hues and sharp edges to visualise their zeitgeist of desperate traumas and disruptions before and during the First World War. Today, the Earth is erupting with irregular behaviours that are being monitored with airborne scanners and cameras that ‘see’ colours, temperatures and shades across parts of the light spectrum that are invisible or obscured from the pupils and retinas of humans. How can artists creating traditionally static objects – paintings and sculptures mostly – demonstrate their relevance to the relentless deluge of EO video visualisations – played across both real and virtual locations? ‘Björk’ (birch), oil on resin painting by Kate Shaw, 2013. Before geospatial simulations began invading our wireless screens, Shaw’s style of art(ifice) might have been dismissed as ‘magic realism’ – a term invoking the Latin American campfire tradition of hallucinogenic stories and visions. Now though, there’s nothing imaginary about magic realism: these facsimiles have deadly implications. Shaw’s visit to Iceland follows earlier research trips to greater and lesser parts of the United States, the jungle of Costa Rica and Australian Aboriginal settlements. While most people would visualise these places via different scenic and tonal compositions, the cortex controlling Kate Shaw envisages all parts of the world as ‘one and continuous’ (to quote ancient geographer Claudius Ptolomy). 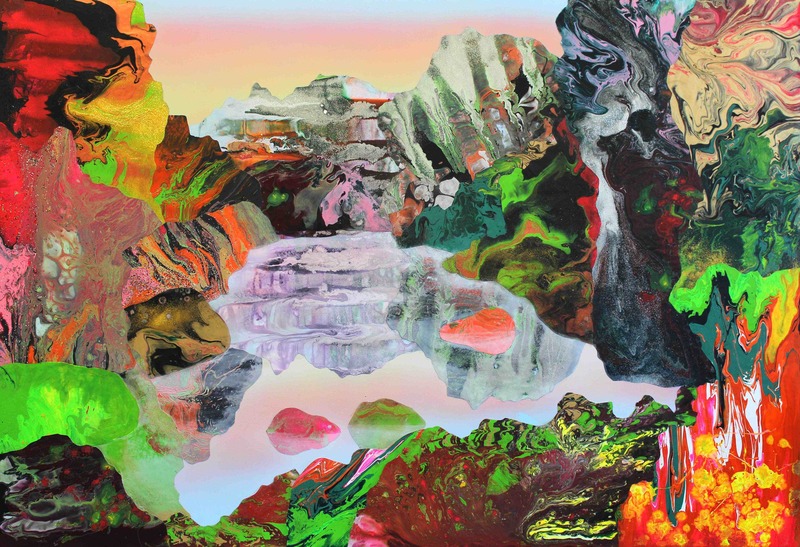 ‘Asdis’, acrylic and resin on board, by Kate Shaw, 2013. On the eternal dichotomy that is currently termed ‘the gender wars’, Shaw subscribes to the ancient trans-tribal concept of ‘Mother Earth’. As well as her depictions of sinuous flows of elements evolving in harmony, names of some works in the Fjallkonen series are Icelandic words for either female or natural life forms. Several months before her Iceland exhibition, Shaw visited New Zealand for the first time – accompanying six of her paintings to the Art Fair in Auckland, my childhood town. Obviously I’m wondering: What might Kate Shaw deliver to NZ’s distinguished lineage of landscape art? How would she interpret potential encounters along, say, the Milford Track, or the black West Coast (from Jane Campion’s film The Piano)? What would be Shaw’s aesthetic reactions to recognisable scenes on Great Barrier Island and the Coromandel? Or the liquifactioned terrains of Christchurch’s post-earthquake red zones? She wouldn’t be an isolated foreigner painting Aotearoa’s idyllic scenes. Following the original European explorers and colonists (concerned mostly with maps and perspective drawings for practical purposes), professional artists have been streaming through the Land of the Long White Cloud since at least Petrus van der Velden and Clas Edvard Fristrom, and others, in the 1890s. NZ’s most exciting period of landscape painting lasted two decades; from the mid 1950s to the mid 1970s. This was the peak of modernism’s arguments between realism (including figuration) and abstraction (including provocative misrepresentation strategies). The major artists of that period – Colin McCahon, Ralph Hotere, Louise Henderson, Don Binney and others – have all been thoroughly categorised, catalogued, archived and retrospectively represented to several generations of new audiences – and there’s a widely agreed lull in the genre, desperately needing new interpreters, offering internationally infected insights, and using both old and new media. What do today’s gatekeepers of ANZ art think should happen with the Kiwi landscape scene – and what do they think of Kate Shaw’s precedents and potentials?